COLORADO SPRINGS, Colo. – Kevin Collins, Jack Parker, Ben Smith, Ron Wilson and Scott Young will be enshrined into the United States Hockey Hall of Fame as the Class of 2017, it was announced today by USA Hockey. Officiating at the highest levels of hockey for parts of four decades, Kevin Collins (Springfield, Mass.) became one of the game’s most respected officials, accumulating a résumé that includes more than 2,000 NHL games as a linesman. His 296 games in the Stanley Cup playoffs rank as the most by an American official. And his 32 games in the Stanley Cup Finals place him second among American officials behind only William “Bill” Chadwick, whose induction into the U.S. Hockey Hall of Fame preceded Collins’ by 43 years. Upon Collins’ formal induction, he and Chadwick will stand as the only Hall inductees to earn enshrinement exclusively for their accomplishments as on-ice officials. Known for his integrity, athleticism and strong skating ability, Collins worked 28 years in the NHL (1977-2005), including 12 appearances in the Stanley Cup Finals. His career also included working four Canada Cup tournaments, the 1996 World Cup of Hockey and the 1998 Olympic Winter Games in addition to a pair of NHL All-Star Games (1988 and 1993). Collins was a pioneer in the development of officiating as a whole. In 1974, he founded the Western New England School of Officiating which, at the time, was the only officiating school conducted in the U.S. and provided the foundation for hundreds of budding professional officials. In 1983, Collins helped USA Hockey create its Officiating Summer Development Camp program and its officiating manual series, both of which remain in use and serve as core components of USA Hockey’s Officiating Development Program. Collins also taught at numerous USA Hockey officiating camps and seminars. Beyond his service as an on-ice official, Collins has also volunteered countless hours to amateur hockey in Massachusetts, serving as a youth hockey coach and director while also coordinating free officiating workshops throughout New England. A legendary figure in American hockey, Jack Parker (Somerville, Mass.) coached 1,484 games at the NCAA Division I level with Boston University over 40 seasons and won 897 of them, amassing a .643 winning percentage, three national championships, 11 conference titles and 21 Beanpot Tournament crowns. He retired after the 2012-13 season as one of only three coaches to be named a three-time recipient of the Spencer Penrose Award as NCAA Division I Coach of the Year (1975, 1978, 2009). Upon his departure from the coaching ranks, Parker had the third most victories in NCAA history, the fourth best winning percentage among NCAA Division I coaches with more than 1,000 games behind the bench, and the most wins at one school (897). While leading his alma mater, Parker helped develop a lengthy list of National Hockey League players and 24 Olympians, among them Tony Amonte, Jim Craig and Mike Eruzione, a triumvirate that played a role in authoring two of the greatest triumphs in U.S. hockey history at the 1996 World Cup of Hockey and the 1980 Olympic Winter Games, respectively. Another Parker protégé, Mike Sullivan, played at Boston University in the 1980s before embarking on a coaching career during which he became the first American head coach to win consecutive Stanley Cups. In addition to his duties at Boston University, Parker answered his country’s coaching call on three occasions, serving as assistant coach of the U.S. Men’s National Team in 1995, head coach of the 1996 U.S. National Junior Team and head coach of the 2013 U.S. Men’s Select Team which won the Deutschland Cup. A graduate of Catholic Memorial High School, Parker also produced a memorable playing career at Boston University, helping win three Beanpot championships and serving as the Terriers’ captain during his senior season (1968). After college, he coached one season at Medford High School before returning to Boston University as an assistant coach where he helped lead the Terriers to NCAA titles in both 1971 and 1972. He took over as head coach at BU in 1973 and was inducted into the Boston University Athletic Hall of Fame in 1994. Ben Smith (Gloucester, Mass.) served as head coach of the U.S. Olympic Women’s Ice Hockey Team in 1998, 2002 and 2006, leading Team USA to the first-ever gold medal in women’s hockey at the 1998 Winter Olympic Games. It was the crowning achievement in a storied coaching career. Described by his players as a direct and passionate perfectionist, Smith compiled a 37-7 record in IIHF Women’s World Championship and Olympic competition during his tenure at the helm from 1996 to 2006, a span that included two gold medals, six silver medals and one bronze medal. And while Smith’s high-profile exploits as a women’s hockey coach gained him enshrinement into the IIHF Hall of Fame in 2016, his hall-of-fame résumé extends far beyond a single brilliant decade. The son of a U.S. Senator, Smith was a standout hockey player at Harvard University in the late 1960s. After graduation, he served as an assistant men’s hockey coach at the University of Massachusetts Amherst while also coaching high school hockey in Gloucester. He eventually became a men’s hockey assistant coach at Yale University, where he served for five seasons before joining Jack Parker’s coaching staff at Boston University. During his nine seasons at BU, the Terriers made three NCAA Tournament appearances and won four Beanpot Tournament championships. Smith’s first taste of international competition came in 1985 when he was named an assistant coach for the U.S. National Junior Team. He served in a similar capacity in 1986 and 1987 and was also an assistant coach for the 1987 U.S. Men’s National Team. In 1988, Smith was appointed as an assistant coach for the U.S. Olympic Men’s Ice Hockey Team. He soon earned his first head coaching appointment, taking the helm at Dartmouth College in 1990 and then moving to the same role at Northeastern University, where he led the Huskies to an NCAA Tournament appearance in 1994. Smith remains active with USA Hockey serving in a player evaluation role for many international teams, including the gold medal-winning 2017 U.S. National Junior Team. Ron Wilson (Bluffton, S.C.), the all-time winningest American head coach in National Hockey League history, amassed 648 regular-season coaching victories, 48 wins in the Stanley Cup playoffs and an Eastern Conference championship with the Washington Capitals in 1998. On four occasions, Wilson piloted his teams to more than 100 regular-season points. He currently ranks No. 10 among all NHL coaches in career victories, having served as head coach with Vancouver, Anaheim, Washington, San Jose and Toronto over 15 full seasons. Wilson also guided Team USA to some of its brightest moments ever, most notably its triumph at the inaugural World Cup of Hockey in 1996. He capped his brilliant international coaching career two decades later, leading the 2016 United States National Junior Team to a bronze medal at the IIHF World Junior Championship. In between, he led the U.S. to silver at the 2010 Olympic Winter Games, adding to a list of international coaching successes that also includes a bronze medal at the 1996 IIHF Men’s World Championship. In all, Wilson stepped behind the bench for Team USA as a head coach or assistant coach on nine occasions, making him one of the country’s most dedicated and prolific coaches. But his contributions to American hockey weren’t limited to coaching. Wilson also played for Team USA in four IIHF Men’s World Championships (1975, 1981, 1983, 1987) and one Spengler Cup (1988). He served as captain of that Spengler Cup team, helping Team USA defeat Canada 8-1 in the championship game. As a player, Wilson made his mark professionally with the Toronto Maple Leafs and the Minnesota North Stars, but he’s perhaps best known in his native Rhode Island as a two-time All-America selection with the Providence College Friars. As a sophomore, he was named ECAC Player of the Year after leading the nation in points (87). He was later inducted into the Providence College Hall of Fame for his efforts. Scott Young (Clinton, Mass.) spent 17 successful seasons playing in the National Hockey League, winning two Stanley Cup championships (1991-Pittsburgh, 1996-Colorado) while amassing 342 goals and 415 assists in 1,181 regular-season games. The former Boston University Terrier ranks No. 15 among all American players in NHL games played, No. 12 in goals and No. 20 in points. He retired after the 2005-06 season with a penchant for clutch goal-scoring, having finished among the NHL leaders in game-winning and shorthanded goals on multiple occasions. His three game-winning goals with St. Louis in the 2001 Stanley Cup playoffs tied for the league lead, as did his two short-handed goals. Beyond his goal-scoring prowess, Young was perhaps best known for his versatility. In addition to playing both forward and defense at various points in his career, he was a valuable contributor on the power play and the penalty kill while possessing the ability to be effective in any role, on any line. Young was also among the most versatile and dedicated competitors for Team USA during a star-spangled international playing career that spanned from 1985 through 2002. He is one of only 12 U.S.-born men’s hockey players to compete in three Olympic Winter Games. Young first forged his offensive reputation in high school, scoring at more than a goal-per-game pace for St. Mark’s School in Massachusetts. His outstanding play earned him a spot on the 1985 U.S. National Junior Team. One year later, amidst a rookie-of-the-year campaign in Hockey East, Young was back with the U.S. National Junior Team, helping lead the squad to its first medal in tournament history. He played a third time with the U.S. National Junior Team in 1987, serving as team captain and earning a place on the tournament all-star team with a team-leading 11 points (7G, 4A). In 1988, Young made his breakthrough on the highest level, debuting in the NHL with Hartford and playing defense for Team USA in the Olympic Winter Games, during which he posted eight points in six contests. He returned to the Olympics as a forward in 1992, and in 2002, earned a silver medal. In total, he amassed 15 points (8G, 7A) in 20 Olympic games. Young also played for Team USA in three IIHF Men’s World Championships (1987, 1989, 1994) and helped author one of the greatest moments in American hockey history as a member of the 1996 World Cup of Hockey champions. After the conclusion of his playing career, which included NHL stops with Hartford, Pittsburgh, Quebec, Colorado, Anaheim, St. Louis and Dallas, Young returned to his native Massachusetts, where he served as a youth and high school hockey coach and as director of hockey operations at Boston University. He is today an assistant coach with the Terriers. 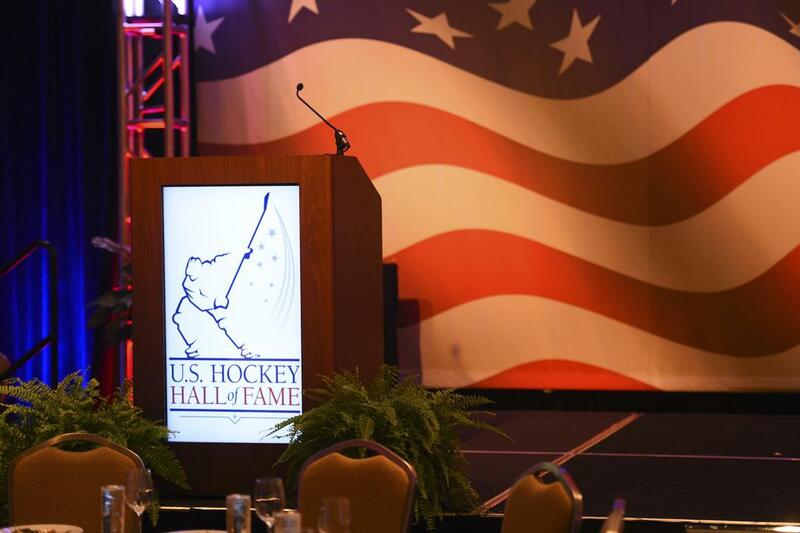 The date and location of the 2017 U.S. Hockey Hall of Fame Induction Celebration, which will include the formal induction of the Class of 2017 as well as the presentation of the Lester Patrick Trophy, will be revealed later this summer. NOTES: U.S. Hockey Hall of Fame inductees are chosen on the basis of extraordinary contribution to the sport of hockey in the U.S. … The U.S. Hockey Hall of Fame was incorporated in 1969 and inducted its first class in 1973. To date, there are 168 enshrined members and four enshrined teams … For information on the members of the U.S. Hockey Hall of Fame, visit USHockeyHallofFame.com ... The U.S. Hockey Hall of Fame Museum, located in Eveleth, Minnesota, is open daily. For hours of operation and admission prices, visit USHockeyHallMuseum.com or call 800-443-7825. ©2019 U.S. Hockey Hall of Fame / SportsEngine. All Rights Reserved.